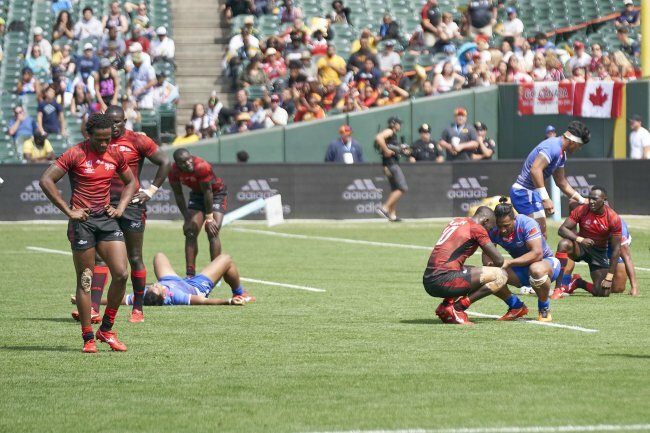 The record card of Kenya at the just concluded Rugby World Cup Sevens in San Francisco read one win, four losses. For a core team in the World Rugby Sevens World Series, the results mean Kenya has to qualify for the next event. Richard Omwela, the Kenya Rugby Union chairman who painfully watched as Kenya crumbled assured this will not be a problem. But it is the manner in which the team approached their matches which has raised eyebrows from the rugby fraternity. Innocent Smiiyu, the Kenya coach explained poor preparations could have dampened the spirits of the players before such a major competition. Add to this a demanding season where players also participated in the Commonwealth Games and one could understand the 'beaten' bodies out there for the three-day event. Kenya's downward spiral started after the pre-qualifier when they blew a 26-0 lead against Scotland to lose 26-31. Simiyu admitted this was unacceptable especially after the team consistently performed well during the Series. But, a 14-24 loss to Ireland in the Challenge Trophy quarter final condemned Kenya to the lower tier of the competition where they set a date with Samoa. It was another narrow 17-19 loss before Japan shut the doors 26-14. Ordinarily, these are teams Kenya would have beaten on any day. Simiyu explained the best team came to San Francisco but the results were disappointing. The writing could have been on the wall when KRU 'disbanded' the team and 'sacked' the coach after an incident in Paris where a sponsor's logo was covered in a protest of non payment of allowances and salaries. Understandably, the mindset of the players turned to their remuneration and although KRU assured payment would be made once the players landed back from Paris. In the process, preparation for the RWC Sevens was compromised. The government stepped in and directly engaged the players with the sponsors also coming in. It could have been at this stage that control of the team was lost. Omwela explained World Rugby were concerned about the wrangles. "They were not sure if Kenya would send a team to San Francisco," he stated. The players were equally disappointed. Collins Injera and Andrew Amondo, the two senior players explained things did not go well. "We failed to deliver and there were little mistakes which chnaged the tide of the game." They admitted the flaws and apologised to Kenyans and fans. Injera was one of the few players who was competing in his third World Cup. "There is a lot of potential in this team," he assured. Overall, it was not a good tournament for the four African teams. South Africa finished third after edging out Fiji for the bronze while Kenya finished 16th, Uganda 19th and Zimbabwe 23rd. The coaches and Union officials were not in favor of the format which was introduced in this tournament which saw Kenya compete in the pre-qualifier. Omwela who is in the Rugby Afrique Board was one of the voices who urged for the format to be reviewed. He observed some of the teams not in the pre-qualifier were given undue advantage. "It is taxing to play in the pre-qualifier. Some of the second tier teams should have been given a chance to play the 'big' teams. This is the only way they can develop," he explained. Kenya 19 Tonga 7 (won), Scotland 31 Kenya 26 (lost), Kenya 14 Ireland 24 (lost), Kenya 17 Samoa 19 (lost), Kenya 14 Japan 26 (lost). Men's Pre-Round 16Kenya 19 Tonga 7, Canada 29 Papua New Guinea 21, France 50 Jamaica 0, Wales 33 Zimbabwe 12, Samoa 45 Uganda 7, Russia 21 Hong Kong 7, Japan 33 Uruguay 7, Ireland 17 Chile 12; Scotland 31 Kenya 26, Argentina 28 Canada 0, Australia 17 France 22, England 19 Samoa 15, New Zealand 29 Russia 5, Fiji 35 Japan 10, South Africa 45 Ireland 7, USA 35 Wales 0. Cup quarter finals: Scotland 5 South Africa 36, Argentina 7 Fiji 43, France 7 New Zealand 12, USA 19 England 24; Semi-finals: South Africa 7 England 29, Fiji 17 New Zealand 22; Final: England 12 New Zealand 33. Play-off: Fiji 19 South Africa 24. Fifth place semi-final: Scotland 0 USA 28, Argentina 26 France 15; Final: USA 7 Argentina 33. Bowl quarter finals: Tonga 29 Chile 33, Papua New Guinea 19 Uruguay 21, Jamaica 10 Hong Kong 24, Zimbabwe 10 Uganda 24; Semi-final: Chile 20 Uganda 17, Uruguay 5 Hong Kong 31; Final: Chile 7 Hong Kong 20. 13th place semi-final: Kenya 17 Samoa 19, Japan 20 Russia 26; Final: Samoa 22 Russia 17. 15th place play-off: Kenya 14 Japan 26. 19th place play-off: Uganda 38 Uruguay 28. 21st place play-off semi-finals: Tonga 31 Zimbabwe 5, Papua New Guinea 52 Jamaica 7; Final: Tonga 14 Papua New Guinea 31. 23rd place play-off: Zimbabwe 33 Jamaica 21.